We believe that students in lower school learn best when their teachers truly know who they are. 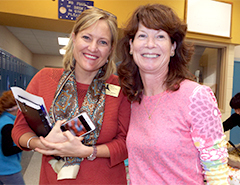 Our small class sizes foster close relationships between teachers and students. Teachers can thus meet students’ individual learning needs with the appropriate amount of challenge and support. 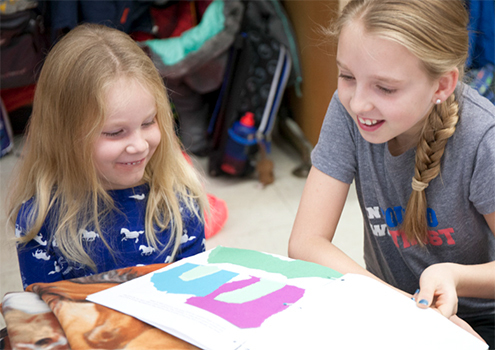 Our Lower School program provides students with a solid grounding in mathematical thinking and language arts, complemented by social studies, science, visual arts, music, physical education, computer skills, and Spanish. Students explore the world through hands-on experiences and become enthusiastic life-long learners. Students engage in a variety of experiential learning activities, from re-enacting life in a one-room schoolhouse to re-creating the Amazonian rainforest. 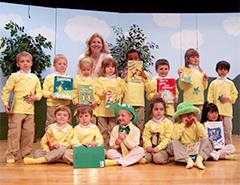 In every grade level, they design, script, and perform class assemblies before the entire school every year. 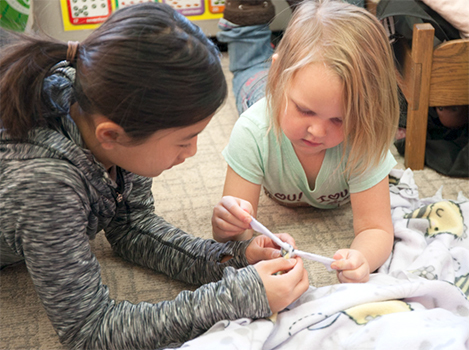 The Lower School nurtures learners who are confident, curious, and joyful. 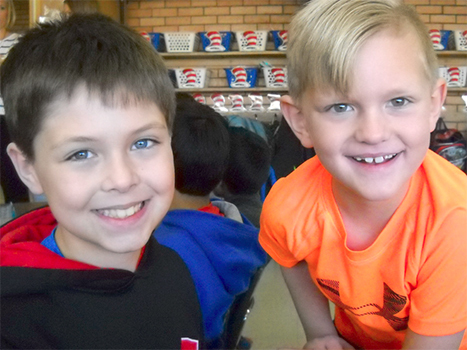 First grade students receive daily instruction in mathematics, shared and guided reading, poetry, grammar, dictation, phonics, spelling, daily oral language, and special unit activities in social studies and science. Shared reading is a small group experience with a new story each week. Here, we focus on oral reading, silent reading, and comprehension. Our guided reading component uses texts selected specifically for each child’s reading level. Reading these high-interest titles, readers discuss story elements and sentence structure. They sharpen comprehension skills and make connections between the stories and their own lives. First grade children are exposed to traditional and modern poetry to help develop important skills in memorization, recitation, language, and personal responsibility. In grammar, students learn everything from basic capitalization and punctuation to sentence structure. Phonics and spelling combine phonics rules with spelling skills. Dictation fosters listening skills and phonics rules to write the sounds the students hear. Daily oral language teaches proofreading and self-correcting skills. Mathematics uses hands on manipulatives to help develop essential skills in addition, subtraction, word problems, and measurement. Students also learn seasonal, relevant topics such as My Family, Friendship, Autumn, Bats, and the Anatomy of the Heart. The small class sizes at our school allow us to challenge each child to his or her full potential. Home projects, book reports, and class plays allow students unique opportunities to demonstrate what they learn in class. Collaborative projects - like building a model of the International Space Station - help students learn more about each other. In math, students work toward mastery of basic addition, subtraction, and multiplication facts using critical thinking strategies. In language arts, students use proofreading and sentence construction skills to write effectively in different genres. We expand our toolbox of resources to include the dictionary, the thesaurus, and cursive handwriting. In reading, students practice various comprehension strategies to help master challenging texts. They continue to work on fluency, story elements and text features. We help students become more independent by encouraging them to take ownership of their learning. Each week students correspond with their teacher through a reading response journal where they can share thoughts and ideas about their independent reading. Students write news stories, press releases, special event summaries, and their first research paper. Additionally, they learn to take notes over nonfiction texts. Students have freedom to follow their unique interests during “affinity time.” We share our learning through oral presentations and reports. In math we focus on multiplication, measurement, time, fractions, mental math, money, basic geometry skills and real life problems. Students continue using the bar model strategy to solve complex problems. We learn U.S. geography, states and capitals. We end the year learning about rainforests and oceans. Fourth-grade students put specific skills into practice in all subject areas. Our goal is for children to develop into responsible students with the maturity and organizational skills necessary for success in the middle grades and beyond. Socially, we emphasize respect for differing opinions and kindness among peers. Fifth grade is a crucial year when students prepare for the increased rigor of middle school. In nearly all areas, students are challenged to consider life beyond the classroom - whether we’re learning about life in Central American or ancient Egypt, reading a work of literature set in 14th century Korea, or studying a current event. Students ask questions, make connections, think creatively and approach learning with curiosity, compassion and persistence. Field trips, guest speakers, films and music contribute to an authentic, exciting learning adventure!